Keywords: diabetes; foot care and disorders; wounds. This article was originally published in the Nursing Standard. It is reprinted in World Wide Wounds by kind permission of the publishers. Diabetic foot ulcers should be treated to maintain health status, improve quality of life, reduce the number of amputations and lower costs. Many centres that treat diabetic foot ulcers use a multidisciplinary team approach, which comprises medical staff, nurses, podiatrists and an orthotist. At the Manchester Diabetes Centre, larval therapy has been used for several years to debride sloughy diabetic foot ulcers. This case history demonstrates the adverse effects of diabetes on feet, and the multidisciplinary team's contribution to successful treatment and healing of a complex foot lesion. Diabetes can cause damage to the nerve and vascular supply in the feet and legs. Patients with neuropathy have reduced or no sensation and, therefore, might be unaware of any trauma to their feet caused by ill-fitting footwear or an object in their shoes, such as a piece of glass, a stone or a drawing pin. Continued walking on an injured foot will damage it further and minor lesions can become more serious. A simple examination of the feet, feeling inside the shoes before wearing them and not walking barefoot can help to prevent minor injuries. Many of the patients attending the diabetes clinic are older and some cannot see, feel or reach their feet, which means that they are often unaware of any injuries. Common factors that contribute to foot ulceration in diabetes are shown in Box 1. Peripheral vascular disease can delay ulcer or wound healing, and infection can lead to the breakdown of tissue and spread to other parts of the foot. Amputation is more common in patients with diabetes, but can potentially be avoided with good preventive care . Diabetic foot ulcers are expensive to treat and can result in limb amputation. These ulcers should be treated to maintain health status, improve quality of life, reduce amputations and lower costs . Many centres that treat diabetic foot ulcers use a multidisciplinary team approach, which comprises medical staff, nurses, podiatrists and an orthotist . The high-risk diabetic foot clinic at the Manchester Diabetes Centre was established in 1987 and has gradually expanded . Between 40 and 50 patients with foot ulcers are seen at the clinic each week for debridement and redressing of foot ulcers. The ulcers are measured and probed before they are redressed. Probing to the bone in a foot ulcer is a clinical sign of underlying osteo-myelitis . Ulcers are graded using the San Antonio Wound Classification System (Table 1), and antibiotics are prescribed if there are clinical signs of infection or if infection is suspected. Patients undergo a thorough foot screening process to assess their vascular and neuropathic status before attending the high-risk foot clinic. They are also given written and verbal information appropriate to their foot problem. Peripheral vascular disease is assessed by feeling the foot pulses (dorsalis pedis and posterior tibialis pulses) and performing non-invasive Doppler waveform assessment. Doppler assessment is not always accurate in patients with diabetes because the arteries become calcified, which results in falsely elevated pressure readings. However, listening to the sound of the waveforms is useful to determine whether they are normal (triphasic) or abnormal (monophasic or biphasic). The test outcomes are scored as 1 for abnormal and 0 for normal neuropathic status, with the exception of ankle reflex scoring, which scores 2 for reflex missing, 1 for reflex with reinforcement and 0 for reflex present. An NDS score of >6 out of 10 predicts that the foot is at risk and is more likely to ulcerate. Callus and dead tissue are debrided from the ulcer by the chiropodist using a scalpel and an appropriate dressing is applied. Debridement of callus can have a beneficial effect on ulcer healing . However, some slough and dead tissue, which is difficult to remove, might remain in the wound following sharp debridement. Biosurgery uses the larvae of the green bottle fly (Lucilia sericata) to debride selectively any sloughy tissue without attacking healthy granulation tissue . Larval therapy has been used at the Manchester Diabetes Centre for several years in inpatient and outpatient departments to debride sloughy diabetic foot ulcers. The larvae are supplied by the Biosurgical Research Unit at Bridgend Hospital in South Wales, where they are bred under sterile conditions before being delivered by courier. Patients are fully informed about how the treatment works and are reassured that the maggots will not digest healthy tissue or burrow into the skin. The healthy skin surrounding the ulcer is covered with a hydrocolloid dressing to protect it from the proteolytic enzymes produced by the larvae. The larvae are secured in the wound under a fine mesh net to prevent escape. Moist gauze swabs are placed over the net and changed on a daily basis to prevent the larvae from drying out. A fresh application of larvae is used twice a week after the old larvae have been removed with forceps or flushed out of the wound with sterile saline. Larval therapy is used until healthy granulation tissue has formed and conventional dressings can then be applied as appropriate. Once the ulcers have healed, patients are provided with insoles and suitable footwear, and are transferred to one of the high-risk follow-up clinics for chiropody care, reinforcement of foot care education and review. In July 1999, Edward Watson, a 68-year-old man with type 2 diabetes and hypertension, was referred to the diabetes centre. This followed his admission in May that year to the orthopaedic ward for exploration and removal of a foreign body (chicken bone) from the web between the big toe and next toe of his left foot. He was taking metformin 850mg three times a day to control his diabetes. Although his foot was infected and sloughy, Mr Watson refused to undergo surgical debridement and discharged himself from hospital in June. His wound was swabbed for culture and grew Staphylococcus aureus (3+) and B Haemolytic streptococcus (3+). Oral antibiotic treatment ciprofloxacin 500mg and flucloxacillin 500mg were prescribed for Mr Watson to take at home. Arrangements were made for the district nurse to visit him regularly to dress his foot. Mr Watson was seen at the diabetes centre for foot screening in December 1999 and was found to have a sloughy, infected wound (Grade IIID) on the left forefoot, with a sinus between the first and second toes that probed proximally to a depth of 1.5cm. A foot X-ray suggested possible osteomyelitis, and clindamycin 150mg was added to the antibiotic regimen. He was advised to rest the foot and avoid walking. Mr Watson's home circumstances were adequate; he lived with his partner, and had a bed in the living room so that he did not need to climb the stairs. All patients undergo routine foot screening and tests and this showed that Mr Watson had a dense pedal neuropathy and co-existent vascular disease. The vibration perception threshold was >50 with absent ankle reflexes, and he was unable to feel a 10g monofilament or distinguish between hot and cold. His NDS score was 10, which indicated that he was at very high risk of ulceration. He also had peripheral vascular disease with absent posterior tibialis pulses, monophasic Doppler waveforms and calcified arteries in his lower legs. Mr Watson was assessed on a weekly basis at the high-risk foot clinic and was prescribed codeine phosphate 8mg and paracetamol 500mg to relieve discomfort. A repeat X-ray was inconclusive, but because the wound swab grew anaerobes and the deep sinus contained purulent material, metronidazole 400mg was also prescribed. Osteomyelitis was suspected, as the ulcer probed to bone. 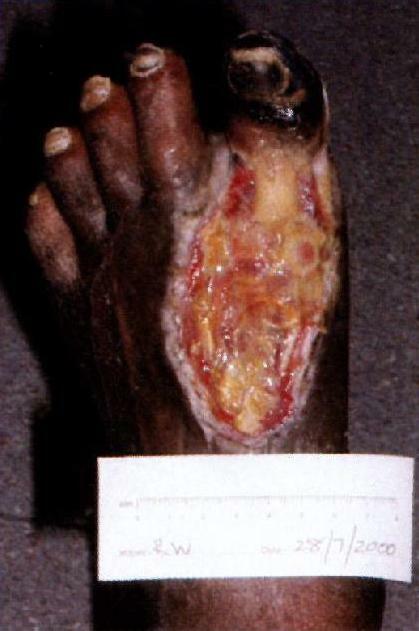 In February 2000, the ulcer on his left great toe measured 10 x 9mm and was classified as Grade IIID. He had a lot of pain in this toe and amitriptyline 25mg was added to the tramadol 50mg and the co-codamol he was taking to control pain. Mr Watson continued to attend the foot clinic, but refused to have surgery or be admitted to hospital. He was started on twice daily insulin injections to improve his glycaemic control. In March 2000, he underwent angioplasty of the left distal superficial femoral artery to improve the blood supply to the feet and legs. By June 2000, Mr Watson's left great toe had become gangrenous and the tendons and bone of the proximal phalynx were visible. Debridement of necrotic tissue proximal to the left great toe revealed a large, sloughy ulcer that measured 55 x 90mm. Mr Watson was recommenced on clindamycin and ciprofloxacin, and sterile fly larvae (maggots) were applied to the dorsum of the forefoot (Figure 1). He attended the diabetes clinic twice a week for renewal of the maggots and the district nurse called daily to replace the moist gauze swabs. The district nurse accompanied Mr Watson on one of his clinic visits to learn how to apply the larvae and then continued his dressing regimen at home. Larval therapy was continued for two months until the dorsal forefoot ulcer was free of slough (Figure 2). The dressing regimen was then changed to that of hydrogel (Intrasite gel) and a non-adhesive polyurethane foam film (Allevyn). Mr Watson continued to attend the clinic on a weekly basis and the large ulcer on the dorsum of his forefoot continued to granulate. He finally agreed to see the vascular surgeon to discuss possible surgery. In December 2000 he was admitted for amputation of the gangrenous left great toe and resection of the first metatarsal head. He was informed that if the operation was not successful, a below-knee amputation would be necessary. Following surgery, the wound was left open for daily packing with a hydrocolloid dressing (Aquacel). The district nurses carried out the dressings at home, as Mr Watson had discharged himself from hospital. His wound continued to heal at home and by February 2001 had filled with granulation tissue and was starting to epithelialise. Mr Watson did not visit the clinic again until April this year, when his foot had completely healed without the need for a major amputation. A large area of slough on the foot was successfully debrided using larval therapy, which allowed the skin to epithelialise and reduced the need for skin grafting. This enabled Mr Watson to stay at home and be treated as an outpatient, with minimal hospital admissions. He had a tendency to discharge himself from the clinic and to miss appointments, which made it difficult to treat his ulcer. However, this became much easier once the district nurses began to apply the larvae dressings. This case history demonstrates the success of the multidisciplinary team approach to patient management in primary and secondary care. Close links were formed with the orthopaedic team, which originally referred Mr Watson to the clinic, and the vascular surgeon, who improved the blood supply to the foot, removed the gangrenous toe and resected the metatarsal head. The health professionals involved have become more experienced in the use of larval therapy and, as a result, patients are not only treated as inpatients, but can also be treated on an outpatient basis. This case history demonstrates the adverse effects of diabetes on feet. The patient had a dense neuropathy, which meant that he was unaware of the chicken bone embedded in his foot. He continued to put weight on the foot, which resulted in a minor foot injury developing into a serious health problem. Poor blood supply to his feet and legs hindered wound healing. In patients with diabetic foot problems, often a combination of factors cause the tissue to breakdown; in this case it was neuropathy, vascular disease and a minor foot lesion that became infected. All of the co-existing factors must be addressed when treating patients with diabetic foot ulcers. Although Mr Watson had good support at home, he did not take good care of his feet, refused hospital admission and missed clinic appointments and, because of this, his foot injury could have resulted in a major leg amputation. The use of larval therapy enabled staff at the diabetes clinic to treat Mr Watson as an outpatient and he was able to avoid extensive surgery as an inpatient. He was happy with this treatment. All members of the multidisciplinary diabetic foot-care team contributed to the successful treatment and healing of this patient's complex foot lesion. Particular credit must be given to the district nurses involved in his care. This article was originally published in the Nursing Standard 2001, Vol 16, No 6, pages 73-6, and was the winner in the Case Report category of the Nursing Standard Biosurgical Awards, 2001. The copyright of this article remains with the Nursing Standard. 1. Knowles E, Boulton A. Is the management of diabetic foot ulceration evidence based? In: Gill G, et al, editors. Difficult Diabetes. Oxford: Blackwell Science Ltd, 2001. 2. American Diabetes Association. Consensus Development Conference on Diabetic Foot Wound Care. 7-8 April 1999, Boston, Massachusetts. Diabetes Care 1999; 22(8): 1354-60. 3. Edmonds M, et al. Improved survival of the diabetic foot: the role of a specialised clinic. Quarterly Journal of Medicine 1986; 60(232): 763-71. 4. Thomson F, et al. A team approach to diabetic foot care: the Manchester experience. The Foot 1991; 1(2): 75-82. 5. Grayson M, et al. Probing to bone in infected pedal ulcers: a clinical sign of underlying osteomyelitis in diabetic pedal ulcers. Journal of the American Medical Association 1995; 273(9): 721-23. 6. Armstrong D, et al. Validation of a diabetic wound classification system: the contribution of depth, infection and ischaemia to risk of amputation. Diabetes Care 1988; 21(5): 855-59. 7. McGill M, et al. Use of Semmes Weinstein 5.07/10 gram monofilament: the long and the short of it. Diabetic Medicine 1988; 15(7): 615-17. 8. Young M, et al. A multicentre study of the prevalence of diabetic neuropathy in the United Kingdom hospital clinic population. Diabetologia 1993; 36(2): 150-54. 9. Steed D, et al. Effect of extensive debridement and treatment on the healing of diabetic foot ulcers. Journal of the American College of Surgeons 1996; 183(1): 61-64. 10. Thomas S, et al. Using larvae therapy in modern wound management. Journal of Wound Care 1996; 5(2): 60-69.